The silver price has taken a beating over the past week, dropping 18% from $28 to $23. Or at least that is what the COMEX is telling us. In reality, the price of silver is nowhere close to $23. Don’t believe me? Try to find silver coins for sale anywhere in the free market at that price. Most major bullion dealers are once again sold out of silver eagles, including my local dealer and some of the main online dealers that I use. The following is a screenshot from Tulving.com, which often has the lowest premiums over spot price for gold and silver coins. 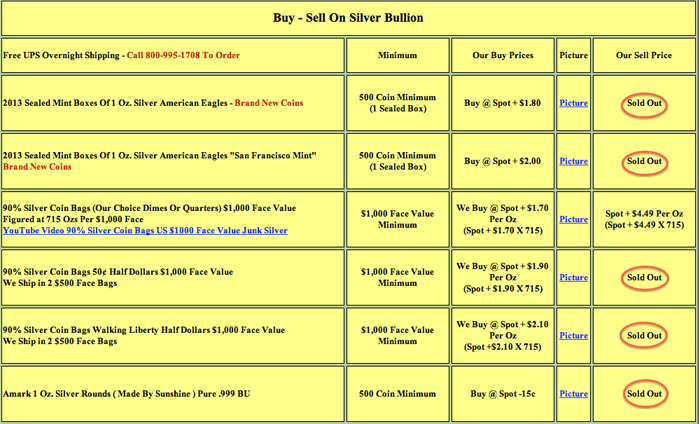 Notice that Tulving is completely sold out of silver eagles, 90% silver half dollars and even generic silver rounds. The only silver coins from this page that are still in stock are 90% junk silver dimes and quarters. Just a few short months ago, they used to sell at or near the spot price, but now sell for a premium of $4.49 per ounce! Supply shortages and rising premiums for silver coins are not isolated to just one dealer. APMEX is another large online bullion dealer that has sold out of monster boxes of 2013 silver eagles. They only list individual rolls for sale at around $630, which comes out to $31.50 per ounce. But wait, I thought the silver spot price was just $23? Even with a significant premium of 15%, the price should only be $26.45. But APMEX is apparently able to sell them for a 37% premium or nearly $32 due to high demand and tightening supply from mint rationing. Even then, the coins are on backorder and you will have to wait until they become available at some time towards the end of the month. 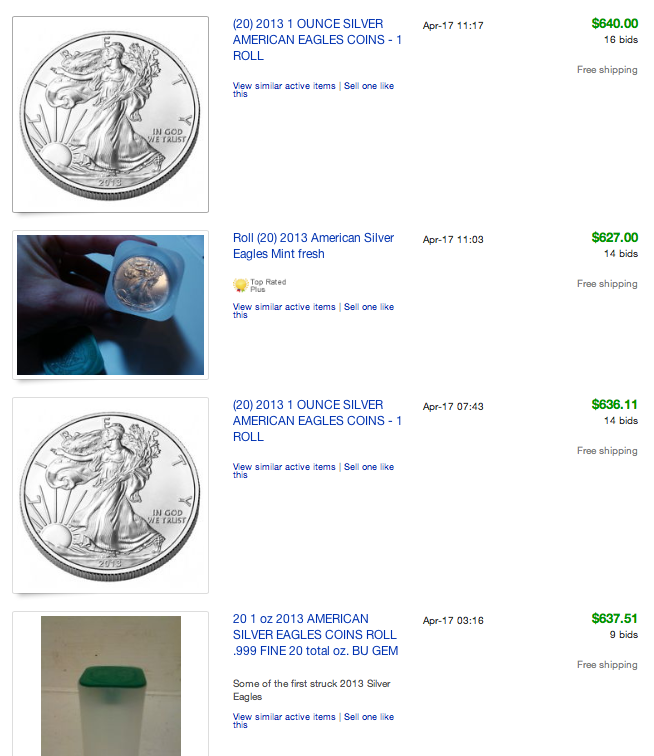 If we skip the dealers and buy silver direct from individuals on Ebay we will certainly be able to find silver eagles closer to the official spot price of $23, right? Nope. The three most recent listings for a roll of twenty 2013 silver eagles sold in the $630 to $640 range. That is between $31.50 and $32 per coin, or just slightly above the price offered for backordered coins at APMEX. If you want silver eagles from 2008 through 2012, those are selling for closer to $33 per coin or $10 higher than the official spot price of $23 from the COMEX. So while we are being told that silver has dropped sharply to $23, the reality is that silver coins are selling closer to $33 per ounce. That is a 43% price difference between the rigged paper price and actual pricing for physical silver in the real world! Of course, silver eagles always carry a premium to the spot price. But just a few months ago and throughout the majority of this current bull market, the premium has been in the 8% to 10% range. I know this because I bought a few rolls of silver eagles in February when the spot price was around $30 and I paid $32.70 per coin. The spot prices for silver that we see on Kitco or other sites are determined by futures contracts. These contracts are traded in much the same way as stocks and other commodities. A future contract exchanges delivery of an item (gold and silver in this case) for a set price, with quantity and exact order details being specified from contract to contract. When considering gold and silver, the most well-recognized platform is COMEX, which stands for commodities exchange. COMEX is based out of New York and is part of the NYMEX, the New York Mercantile Exchange. Gold and silver both find the bulk of their pricing determined by the trades that take place on the COMEX or on the LBMA in London. When futures contract trades take place, the prices of gold and silver adjust accordingly. Futures contracts are used to set the spot prices because the majority of the daily traded volume of gold and silver is done electronically as opposed to physically. The contracts on these exchanges are highly leveraged, with approximately 100 oz of paper gold contracts backed by 1 oz of physical gold. For silver, the ratio is thought to be about 350:1. A very very small number of bullion banks (2 to 4) control up to 95% of these paper contracts, and hence are able to influence the price of physical bullion. Selling of paper Comex contracts on Friday, April 12th, and Monday, April 15th, totaled 1 million contracts, exceeding global annual gold production by 12%. The attack succeeded when the technical support in the low $1500’s/oz. easily gave way and led to waves of forced selling. The volume is without precedent and has all the characteristics of a panic liquidation driven by naked short selling. What I find particularly interesting is that on April 1st of this year, when silver was trading at $28/ounce on the COMEX, silver eagle rolls were selling for just above $650 on Ebay or $32.50 per ounce. Fast forward to today when the silver price has supposedly crashed by over $5 in two days time and a roll of silver eagles is selling for around $640 on Ebay or $32. So the true free market pricing for silver has only dropped about $0.50 per ounce in the past few weeks, not $5. The COMEX paper market pricing has become distorted, divorced from reality and no longer serves as honest price discovery. The recent waterfall price drop has convinced many investors that the silver price is crashing and the bull market is over. These weak hands have reacted by panic selling their positions into the hands of the big banks that have pulled off another con job on an unsuspecting investing public. This really begs the question, why should anyone pay attention to the COMEX futures spot price? If you are holding physical metals, they are still worth roughly the same as they were before the fake crash and continue to appreciate in true purchasing power each year. So don’t fall for this game of short-term manipulation. If you hold mining stocks, you should also resist the emotional urge to panic sell and exit your positions. This disconnect between true free market pricing and COMEX manipulation will come to an end soon. The value of the gold or silver that the miners own hasn’t really dropped, so any waterfall decline in share price is nothing more than a buying opportunity. It should be glaringly obvious by now that gold and silver prices are heavily manipulated. GATA has been correct all of these years, even when their message was met with ridicule or fell on deaf ears. This manipulation is taking place because gold and silver are money and in competition with the flood of fiat notes being printed. The current political and economic power resides with those that have the ability to print money, particularly the world reserve currency. Those in power will fight any challenge to the fiat fractional reserve banking system and the U.S. will fight to keep the dollar as world reserve. But this is a battle that will be lost, which is being shown via increasingly blatant and desperate attempts at maintaining the status quo. With the rise in popularity of precious metals and alternative currencies such as bitcoin, it appears the days of the dollar are numbered. If the elite can keep the price of gold and silver from rising too rapidly, it gives the illusion that inflation is in check and makes their fiat money appear valuable and stable. The FED has nearly unlimited resources and has been using this power to slow the rise of precious metals, while their member banks reap the rewards of siphoning wealth from the less sophisticated investment public. I believe that the proper course of action is to resist the urge to sell, keep your emotions in check and use their manufactured dips as a buying opportunity. You may not be able to find physical silver for $23, but you can pick up oversold silver funds such as PSLV, royalty companies and mining stocks on the cheap right now. The manipulators have convinced investors to dump their shares under the false guise of rapidly falling prices and this has resulted in some significant distortions in value. Imbalances and distortions such as this don’t tend to last very long. The big banks need only run the manipulation long enough to force funds to liquidate positions on technical stops and weak-handed investors to panic out of their positions. They can then swoop in, cover their short positions, pick up bargains and profit again on the way up, just as they did on the way down. It is a zero sum game and the investing public is the proverbial sucker at the poker table. Avoid this trap, ignore their price fixing, buy quality mining stocks during sell offs and keep stacking. Don’t be the sucker at the table. Despite the well-timed propaganda from Goldman Sachs and media blitz of bearish sentiment on gold, the bull market in precious metals is nowhere close to being over. The official inflation adjusted higher for gold is $2,400 and the real inflation-adjusted high is over $8,000 according to economist John Williams of Shadowstats.com. We will see these numbers at a very minimum before all is said and done. If you want to know which bullion funds, mining stocks and royalty companies I believe will outperform during the next wave higher, you can click here to sign up for my monthly newsletter and premium membership.